Time for some Greek kafe! What the 'karak chai' is to India, the coffee is to Greece. It isn't unusual to see men and women chit-chatting at sidewalk cafés over a cup of the distinctive Greek coffee blend. Greece may be a relatively small country, but that doesn't stop it from being the 16th leading consumer (per capita) of this bittersweet beverage in the world. As per popular observations, the Greeks like to sit down for an average of about one and a half hours with their cup of coffee before vacating their seats in cafés and cafeterias. What makes the Greek coffee stand out is that it is boiled, not brewed. A briki (a small, brass, lipped pan with a long handle, as seen above) is used for preparing this special blend. The boiling process creates the distinctive foam, called kaimaki, above the coffee. Moreover, boiling helps the coffee retain more of its nutrients while reducing the amount of caffeine, than the brewing method does. 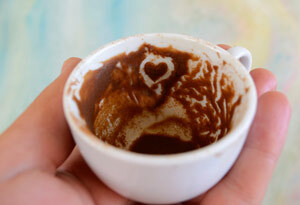 Greek coffee is traditionally had throughout the day, around three to four cups, in demitasse cups. Interestingly, there are quite a few superstitions associated with the Greek kafe. The kaimaki atop the coffee is said to be a good indicator of the weather. If the foam bubbles in the centre of the cup, the day is predicted to be bright and sunny; if the foam forms against the sides of the cup, the weather is forecasted to be overcast with rains. Few Greek folks also believe that you could see a person's fortune by assessing at the grounds and sediments left in their coffee cup. 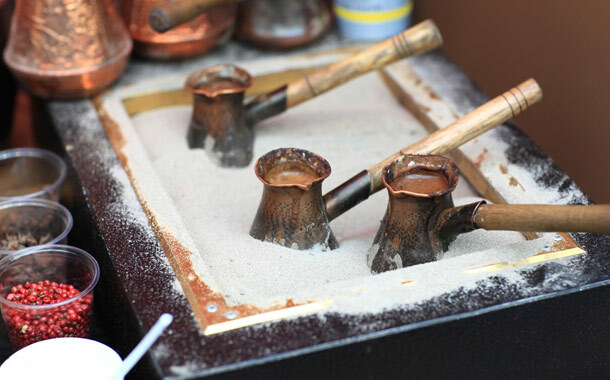 Traditional Greek Coffee: The traditional Greek coffee, "ellinikós kafés", is dark and thick. Finely ground coffee beans and sugar are added to water in the briki and simmered over low heat until the mixture is foamy. It is served in small china cups. Greek Style Frappe: A splendid alternative to the traditional Greek coffee is the accidental frappe! A popular summer drink, the Greek Style Frappe is concocted by shaking instant coffee, sugar, and water in a shaker until a thick frothy layer is formed. The coffee is then served in a tall slender glass, topped with ice and evaporated milk. Freddo and Freddo Cappuccino: The Freddo is a double Espresso shaken with ice and served with crushed ice floating on top. The Freddo Cappuccino is similar, but a dollop of cream is added on top. Freddocino: The Freddocino is another cold coffee beverage, made by blending sugar, instant coffee powder, and sugar in a slushy machine.The Freddocino was introduced in Greece in the 1990s and now contributes up to one-third of the Greek coffee sales. If you're planning to book your flights and head to Greece this season, ensure to savour a cup or two of Greek coffee, either at a curbside or a seaside café. You may even want to pack a pound of coffee beans or a briki to help you remember your trip!